In the 21st century, when millionaires get tax breaks and people are judged by the type of car they drive, it’s nice to be able to retreat and look at art with a simpler outlook on human existence. And by art, I’m not talking about massive canvases or room-size installations: I’m talking about fan paintings from Japan. They are a beautiful and fascinating genre of painting, and gave me my “blissed out” moment of the week. Fan painting is truly an example of finding beauty in small things, something from which 21st century culture – both East and West – could take a lesson. It is also an attitude which I like to stress from time to time: bliss in everyday objects. After the introduction of Zen Buddhism into Japan in the twelfth century, there was a renewed interest in Chinese painting. The landscape traditions of Chinese painting were translated into impressionistic, brushy works in Japan. These landscapes were suggestive, often contrasting vast emptiness with mountains or lakes. This positive-negative space emphasis implied the Zen ideas of the emptiness of the human soul. There was a stress on simplicity, spontaneity and calm. The predominantly monochromatic paintings were a contrast to colorful, decorative, and often highly detailed traditional Japanese paintings. From a very early point, Chinese-influenced painting was the favorite art form of rich people: the nobility, the samurai, Buddhist scholar/monks, and members of the military government: the shogunate. Perhaps the most influential group of painters in Japanese history were those of the Kano “School,” an atelier founded in Kyoto by Kano Masanobu (1434­­­­­­–1530). The school, which specialized in Chinese-style painting, consisted of an extended family of artists that also included artists who were adopted, or who adopted the Kano name out of respect. The school was closely aligned with the shogunate, and thus secured the most lucrative commissions from the upper classes. The school did not have a single distinctive style, and indeed, eventually merged the Chinese style with elements of indigenous Japanese painting. Kano Tsunenobu was a direct descendant of Masanobu, achieving the position of imperial household painter in Kyoto in 1704. Like prominent artists in every culture, Tsunenobu produced not only large scale works (screens, hanging scrolls and handscrolls), but also smaller works such as albums and fan painting. 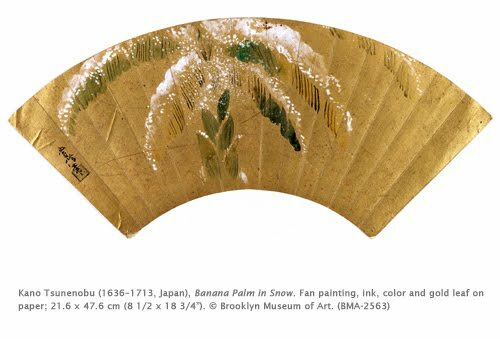 This fan displays the Zen idea of understated simplicity, with the Japanese use of gold leaf and color. Used by men and women alike, fans had many applications in Japan, including making signals and as a sign of rank. They were also important in dance performance, and in kabuki theater.